Air travelers are being warned not to use their Samsung Galaxy Note 7 smartphones on planes after the company recalled the devices over complaints the batteries can catch fire. "In light of recent incidents and concerns raised by Samsung about its Galaxy Note 7 devices, the Federal Aviation Administration strongly advises passengers not to turn on or charge these devices on board aircraft and not to stow them in any checked baggage," the FAA said late Thursday in the U.S. The unusual warning adds to the headache for Samsung (SSNLF), the world's biggest smartphone marker, as it scrambles to replace millions of Note 7 phones around the world. Some international airlines have already taken steps to stop people from using the devices on their aircraft. Singapore Airlines (SINGF), Qantas (QABSY) and Virgin Australia say they are telling passengers not to turn on Note 7s or charge them on flights. It wasn't immediately clear how major U.S. airlines would respond to the announcement by the FAA, which has previously warned that fires caused by the type of batteries found in cellphones can be very difficult to extinguish aboard planes. Delta (DAL) said in a statement that it would "comply with any directive and are studying this matter." American (AAL) on Friday evening said it will tell fliers at the gate and on board the plane to turn off their Note 7 devices. "Due to a recall of the Samsung Galaxy Note7, the Federal Aviation Administration advises these devices remain powered off and not connected to any power source while on board the aircraft," American will tell passengers. "We appreciate your cooperation." Earlier Thursday, JetBlue (JBLU), Spirit (SAVE), United (UAL) and Virgin America (VA) didn't respond to requests for comment on the Galaxy Note 7. Southwest (LUV) referred questions on the phone to the FAA. Korean Air, the flag carrier in Samsung's home market of South Korea, said it doesn't so far have any plans to restrict use of the Note 7 on its planes. The country's Ministry of Land, Infrastructure and Transport said in a statement on Friday that it would not prevent passengers from bringing the phone onto aircraft, or stop them from charging the device during flight. Samsung said a week ago that it was halting sales of the Note 7 and would recall 2.5 million devices in 10 countries, including South Korea and the U.S. The company will replace them with new Note 7 phones. 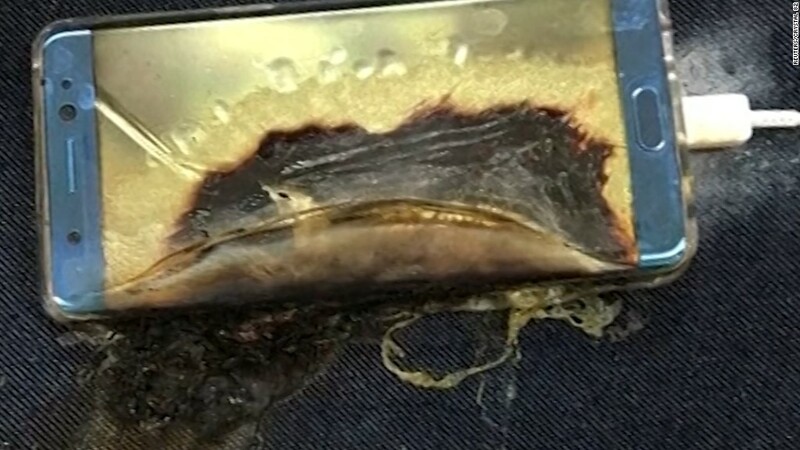 Samsung was responding to dozens of complaints from customers that their phones had caught fire while charging. It said it had investigated the issue and found a problem with the batteries in a small number of Note 7 devices. The embarrassing announcement came just two weeks after the flagship phone's release and days ahead of the unveiling of rival Apple (AAPL)'s iPhone 7. Samsung didn't respond to a request for comment on the use of the Note 7 on airplanes. Its shares dropped 3.9% in South Korea on Friday. U.S. federal transportation rules permit the lithium batteries found in cellphones and similar electronic devices to be checked or carried on board planes. But recalled or damaged batteries are forbidden. A comprehensive U.S. ban on using the Note 7 on airplanes could be triggered by an official recall on the product. Such a decision needs to be made by the Consumer Product Safety Commission, which so far has not commented on the Samsung phone. - Reed Alexander, Sheena Jones, K.J. Kwon and Rene Marsh contributed reporting.